Plot: In 33 AD, a Roman Tribune in Judea is tasked to find the missing body of Jesus Christ who rose from the dead. Starring: Joseph Fiennes, Tom Felton, Peter Firth, Cliff Curtis. 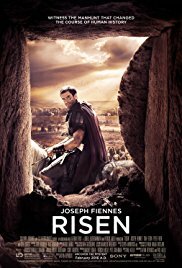 distributed by TriStar «Risen» in the US movie theaters released on February 19, 2016 and has grossed over $46 million worldwide; dvd and blu-ray release date was set for May 24, 2016. Rent from Netflix and Redbox from May 24, 2016. «Risen» in the UK released in movie theaters on March 18, 2016. The movie released on dvd and blu-ray on July 25, 2016.